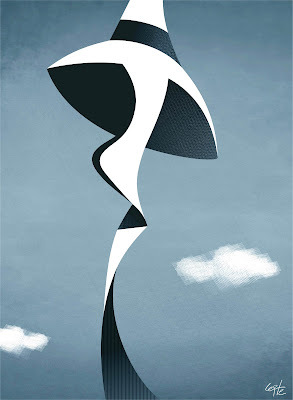 For his pioneering work in manned flight Alberto Santos-Dumont is officially called the "Father of Aviation" in his native country of Brazil. 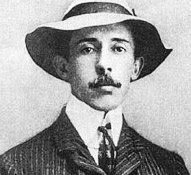 Santos-Dumont left Brazil when he was eighteen and moved to Paris, France, where he applied his mechanical skills and considerable inheritance to building and flying aircraft. He first worked on balloons in the late 1890s, then turned his attention to "heavier-than-air" machines. In 1906 Santos-Dumont flew 715 feet and became internationally famous as the first man to fly an airplane -- a claim that was later denied him when it turned out that The Wright Brothers had flown their own plane secretly in 1903. Unlike the Wright Brothers, Santos-Dumont was a flamboyant socialite who loved the limelight -- he used to fly around Paris in his powered balloons, hobnobbing with the rich and famous. In 1909 he built the "Demoiselle," a lightweight monoplane that captured the public's attention and became a popular seller in England and France. In 1910 he retired due to illness (now described as multiple sclerosis), and in 1928 he returned to Brazil, where he was greeted as a national hero. Apparently despondent over the militarization of airships, he committed suicide in 1932.
mas por todas as outras aki no seu blog! Seus estilo é d+, muito foda!